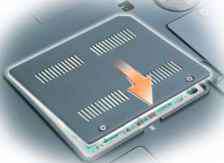 ^^ NOTICE: To avoid damaging the system board, you must remove the main battery before you begin working inside the computer. 1 Follow the procedures in "Before You Begin" on page 81. 2 Ground yourself by touching one of the metal connectors on the back of the computer. Wjt NOTE: If you leave the area, ground yourself again when you return to the computer. 3 Turn the computer over, loosen the captive screws on the memory module cover, and then remove the cover. NOTICE: To prevent damage to the memory module connector, do not use tools to spread the memorymodule securing clips. a Use your fingertips to carefully spread apart the securing clips on each end of the memory module connector until the module pops up. b Remove the module from the connector. 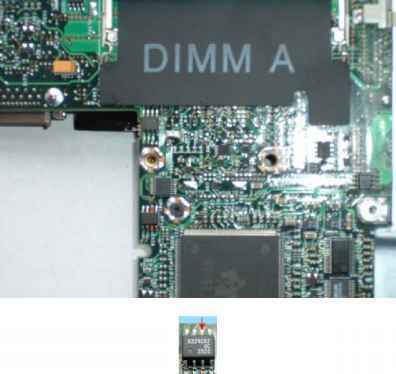 NOTICE: If you need to install memory modules in two connectors, install a memory module in the connector labeled "DIMMA" before you install a module in the connector labeled "DIMMB." 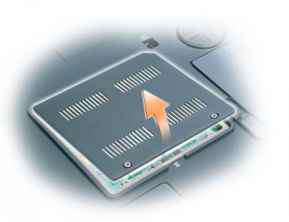 Insert memory modules at a 45-degree angle to avoid damaging the connector. NOTE: If the memory module is not installed properly, the computer may not boot properly. No error message indicates this failure. a Align the notch in the module edge connector with the tab in the connector slot. b Slide the module firmly into the slot at a 45-degree angle, and rotate the module down until it clicks into place. If you do not feel the click, remove the module and reinstall it. 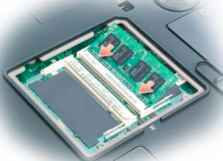 6 Replace the memory module cover. ^^ NOTICE: If the cover is difficult to close, remove the module and reinstall it. Forcing the cover to close may damage your computer. 7 Insert the battery into the battery bay, or connect the AC adapter to your computer and an electrical outlet. 8 Reinstall the hard drive. See "Hard Drive" on page 83. 9 Reinstall the optical drive. 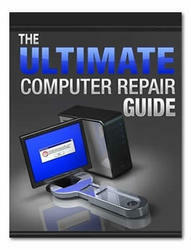 See "Optical Drive" on page 97. 10 Turn on the computer. As the computer boots, it detects the additional memory and automatically updates the system configuration information. If prompted, press <F1> to continue. To confirm the amount of memory installed in the computer, click the Start button, click Help and Support, and then click Computer Information.